Happy new year to all of my Blanton family cousins and my Geneablogger friends. I truly appreciate those of you who have read and commented on my blog this year. I’m not one to make a bunch of New Year’s Resolutions, but I have a few in mind. I have only made 31 posts to my blog this year and I will try to do better next year. I am not a writer like many of the wonderful Geneabloggers. I started this blog to give out more information about the families I am researching. I’m not sure where I will go with my blog this year, but I’m hoping to get more of my family information on here. I have the majority of it on my web site, but it doesn’t hurt to have it in two places. I’m also hoping to join at least one of the nearby genealogical societies where many of my ancestors lived. Now that I’m living nearby, it will be possible for me to attend their meetings. I would also love to go to one of the genealogy conferences, but I’m not sure if I can make that happen this year. Happy New Year everyone. Here’s wishing that we all make some wonderful discoveries this year and break down some of those brick walls! 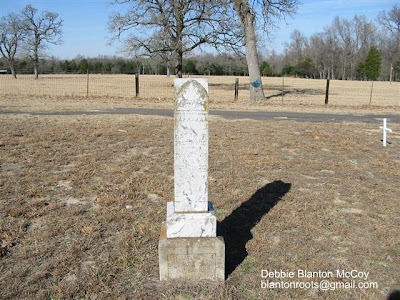 Prairie Springs Cemetery is located on Highway 64 just a few miles southeast of Canton, Texas. 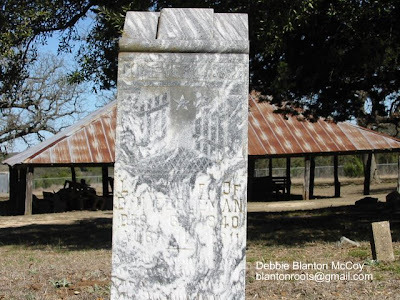 According to the historical marker in the cemetery, it dates back to 1866. I have 29 family members buried in this cemetery, mostly from my Prestridge and Slaughter lines. Most of their tombstones can be found in two rows in the northeast corner of the cemetery. 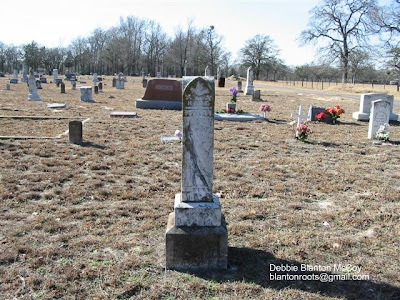 When I lived in east Texas, I was only about an hour away from the cemetery and I visited it often. It is one of my favorite cemeteries and I stopped by there on a recent trip to Longview. I don’t know why I keep being drawn back there, but maybe one day it will lead to a discovery. John Wesley Blanton was the son of John Martin Blanton and Julia Ann McAnear. He married Sirena C. Kennedy on the 7 Nov 1899 in Johnson County, Texas. 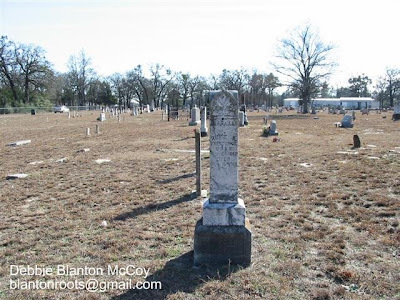 They had 3 children: Leonard A. Blanton, Robert Lee Blanton, and Flora Kyrene Blanton.